The purpose of the fund is to support the scientific work and teaching of Dr. William L. Duax, and of future generations of Hauptman-Woodward scientists. We are most grateful to Mr. Roy J. Carver, Jr., a friend of Dr. Duax’s from the University of Iowa, for his pledge of $300,000 to establish this fund. It is our hope and goal to grow this fund by making vivid to others the importance of Dr. Duax’s work and educational programs, and of the opportunities he has created for the scientific youth of our community. Our challenge now is to match Mr. Carver’s gift. Your support will make a difference. Donations may be mailed to: HWI Duax Chair, 700 Ellicott Street, Buffalo, NY 14203 USA. Dr. William L. “Bill” Duax‘s distinguished career at the Hauptman-Woodward Institute has spanned more than four decades, and has encompassed major contributions in research, education, and Institute leadership. On the education side, he has developed an innovative and wildly popular program to mentor high-school students from many Buffalo city, private and suburban schools. These students show their enthusiasm by being willing to train at HWI, on their own time, for two afternoons a week after school as well as all day Friday. “If they want to learn more about scientific research, and are willing to give themselves to it, they should have the opportunity”, says Bill Duax, affectionately known as the “Pied Piper of Bioinformatics”. These students are particularly adept to the computer programming and critical thinking skills needed for work in the Duax computer lab. 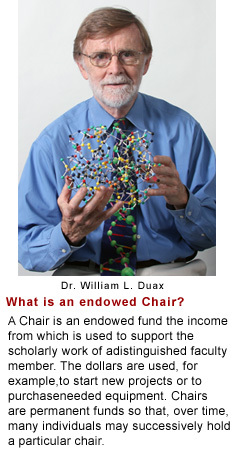 Currently, the students are assisting Duax with his newest research project, the evolution of the genetic code. Bill’s research contributions include over thirty years of NIH-funded research on the function and structure of steroid hormones. During this period, he received a coveted MERIT award from NIH, and published over 275 scientific papers. Bill has also made enormous contributions both to the Hauptman-Woodward community, and to his professional field at large. He has served as the Head of the Molecular Biophysics Department from 1970 to 1988, as HWI Research Director (1988-1993), and as HWI Executive Vice President for Research (1993-1999). In addition, he has been the President of both the American Crystallographic Association and the International Union of Crystallography.